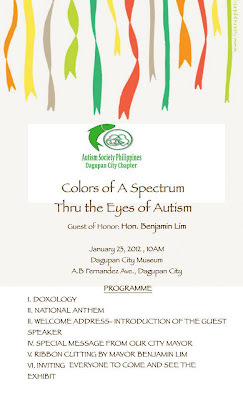 The Autism Society Philippines Dagupan Chapter in cooperation with the Dagupan Bangus Litratistas would like to invite everyone to grace the Opening of the Photo Exhibit: Colors of A Spectrum Thru the Eyes of Autism on Monday, January 23, 2012, 9am at the Museo na Dagupan (Dagupan City Museum). The Photo exhibit will run from January 23- 25, 2012 at the Museo na Dagupan and then transferred to the CSI City Mall Atrium on January 27-29, 2012. 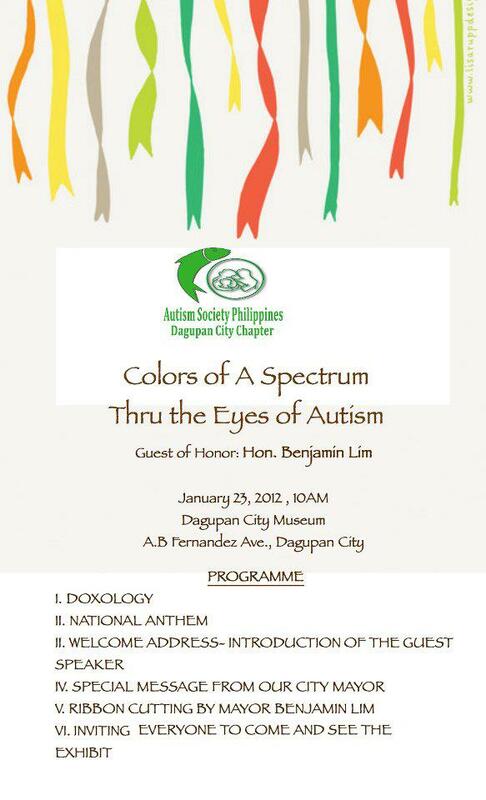 For more details, please get in touch with ASP Dagupan Chapter President, Dr. Christina Broncano at 0905 3309194.